Rev. 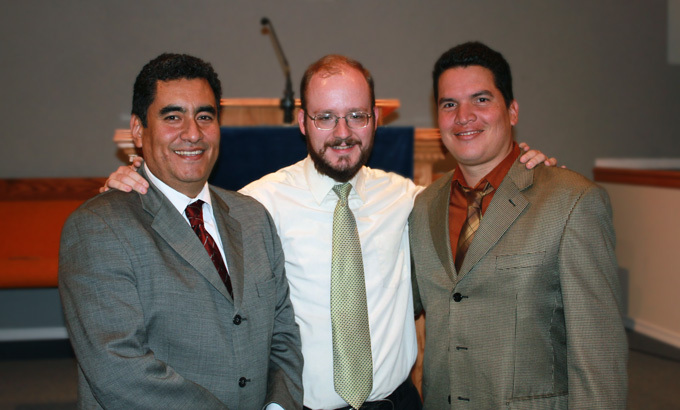 Jason Boyle (centre) with Pastors Lalo Peña (left) and Marcus Reyes (right) following their acceptance to come under care of Presbytery to eventually be considered for licensing and ordination. VANCOUVER—Two Mexican pastors were accepted under care of presbytery by the ministers and elders attending the Free Presbyterian Church of North America (FPCNA) week of prayer, held October 6-10, at Cloverdale Free Presbyterian Church outside Vancouver, British Columbia. 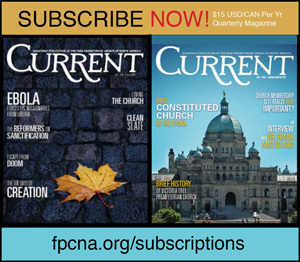 Marcus Reyes and Lalo Peña sent a letter to the FPCNA requesting affiliation with the denomination after coming into contact with Jason Boyle, a FPCNA missionary stationed in Mexico City since 2010. Reyes contacted Boyle after they had Google searched “head covering” and “Reformed.” This led to a one-year friendship resulting in the men making application to come under care of the FPCNA presbytery, which means they would be trained and eventually considered for licensing and ordination. Lalo Peña comes from a charismatic background, and Reyes from a Brethren Assembly. Reyes ministers to about 100 churches as an itinerant in Mexico, and also sends electronic Bible studies. Rev. Colin Mercer, secretary of the FPCNA mission board, and Dr. Charles Barrett, interim president of the denomination seminary, examined Reyes and Peña during a March 2014 trip to Mexico to visit Boyle. Then, six months later, another two ministers did the same – Rev. Reggie Kimbro from Grace FPCNA in Winston Salem, North Carolina, and Rev. Myron Mooney, from Trinity Presbyterian Church (FPCNA) in Alabama. Eventually Reyes and Peña were invited to Vancouver, where they were examined in a private meeting held by the church extension committee, and then in a public meeting before the entire presbytery. “I have been praying for a long time to find a church with similar views to my own,” Reyes said with tears as he spoke to the presbytery. “I believe the Lord has brought us together.” Peña also expressed thanks and said that he appreciated the presbytery taking the time to consider them.